Are these part of the first Viking boat burial found in England? A hoard of treasure found in a field in Yorkshire could be one of the most significant Viking discoveries in Britain, experts say. 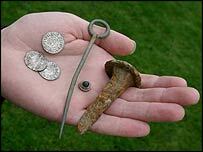 The silver coins, sword fragments and boat nails, from the 9th Century, are thought to be from a boat burial. If confirmed, it will be the first Viking boat burial found in England and will increase understanding of Viking life in Yorkshire, archaeologists say. A full excavation of the secret site is planned to look for evidence of a boat. Archaeologist Simon Holmes, from the Yorkshire Museum, said: "If this is indeed the case, it will be the first Viking boat burial discovered in England and therefore one of the most important Viking discoveries ever made in the British Isles. "This find is extremely significant and will increase our understanding of what the Vikings were doing here in Yorkshire in the late 9th Century." Metal detecting enthusiasts discovered the items in December 2003 at a location which is not being disclosed in order to protect the site. The treasure hunters reported the hoard to the national Portable Antiquities Scheme, which contacted the Yorkshire Museum in York. The 130 individual items will be on display at the museum until the end of February before going to the British Museum in London for further study. The famous ship burial at Sutton Hoo in Suffolk, which was found in 1939, dated from the 7th Century and contained the treasure of an Anglo-Saxon warrior, not a Viking.